Destiny, a video game in which players travel through the galaxy and battle against random loot tables, is by most accounts a commercial success. But over a year after release, publisher Activision still won’t say how many copies they’ve actually sold. This secrecy is typical in the video game industry, where even the biggest publishers refuse to disclose basic sales data, and the most popular sales-tracking website pretty much makes everything up. Video game companies tend to be opaque about these things, which is frustrating for those of us who analyze and critique the industry. Destiny is an unusual case, though. Savvy observers might have noticed that Activision loves talking about Bungie’s much-hyped MMO-shooter. They talk about it all the time. Every few weeks it feels like they’re sending out a new set of hilariously meaningless Destiny stats, designed to make news headlines and puff up the game without giving out the one number that actually matters. With that in mind, it’s fun to look at what they actually will send out. So here is a list of Things They’ll Talk About Besides What Destiny Actually Sold. SANTA MONICA, Calif.—(BUSINESS WIRE)— Activision Publishing, Inc., a wholly owned subsidiary of Activision Blizzard, Inc.(Nasdaq: ATVI), announced today that the company sold more than $500 million of Destiny into retail stores and first parties worldwide as of day one, making the game the biggest new video game franchise launch in history. SANTA MONICA, Calif.—(BUSINESS WIRE)— Activision Publishing, Inc., a wholly owned subsidiary of Activision Blizzard, Inc.(Nasdaq: ATVI), announced today that its highly anticipated new franchise Destiny sold-through more than $325 million worldwide in its first five days, according to Chart-Track, first parties, retail customer sell-through information and Activision Blizzard internal estimates. ...and participated in 137 million activities. The game has won over 180 awards and nominations to date. The average player has played Destiny 20.9 times. 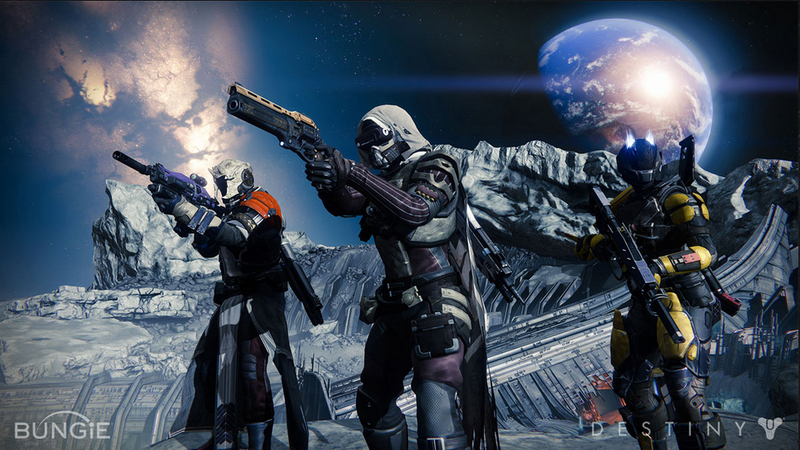 Destiny averages 3.2 million players each and every day! Over the past three weeks, we’ve had more players online in Destiny than we did during the same span for Halo 3 and Halo: Reach, combined. Destiny is the most-played title on the PlayStation®4 (PS4™) system with 125 million hours of gameplay. In addition to strong sales of software at retail in the US, the first month of Destiny included strong digital sales and a very popular PlayStation 4 hardware bundle as well. Incorporating these figures, not only is Destiny the biggest new franchise launch in video game history, its launch month retail sales rank in the top 10 largest of all time in the US*. In fact, it’s the only new video game franchise in the top 30 all-time based on U.S. retail sales in the launch month**. “We’re, of course, ecstatic that Destiny has set sales records. But what we’re most excited about is that this is a game that millions of fans can’t seem to stop playing. A month after launch, people are still playing Destiny an average of three hours per day, which is phenomenal engagement.” said Eric Hirshberg, CEO of Activision Publishing. For the third quarter, Activision Publishing’s Destiny was the largest new franchise launch in videogame history and ranks among the top 10 largest videogame launches of all time in the U.S. To date, Destiny has more than 9.5 million registered users and our active players are playing the game an average of more than three hours per day. First of all, I think by any measure Destiny’s off to a great start. As I mentioned, we were the largest new franchise launch of all time, and despite the large investment... or maybe because of that large investment, we were able to be profitable from day one. And we think it’s only a matter of time now before it becomes our next billion-dollar franchise. I also mentioned the pretty incredible engagement numbers. The average player is investing over three hours of gameplay per day, and to date we have 9.5 million registered users. Of course that’s a relationship to sell-through, it’s not exact, because some people have more than one identity. But obviously that’s directional. So it’s a highly-engaged audience that is hungry for more content. And when we’ve had that, we think we’ve been good at providing them with more content to satisfy that demand, which we’re planning on doing on December 9 with our first expansion pack. And I also mentioned that we’re also already underway on our next full game releases. So we’ve got a great pipeline of content, a great plan, a great development partner with Bungie, and we’re very bullish on Destiny. Kotick added “We expanded our franchise portfolio by launching two of the industry’s most successful new brands, Blizzard’s Hearthstone: Heroes of Warcraft, and the biggest new IP launch in industry history, Destiny. Combined, these franchises... generated more than $850 million in non‐GAAP revenue. Activision Publishing’s Destiny and Blizzard Entertainment’s Hearthstone: Heroes of Warcraft combined now have more than 50 million registered players and nearly $1 billion in non‐GAAP revenues life‐to‐date. Activision Publishing’s Destiny continues to have strong engagement, with active players playing about 3 hours per day, along with strong digital sales and expansion attach rates. Additionally, Destiny was awarded Game of the Year by the British Academy of Film and Television Arts, a prestigious addition to the 31 Game of the Year awards that Destiny has been honored with to date. Bungie and Activision Publishing, Inc., a wholly owned subsidiary of Activision Blizzard, Inc. (NASDAQ: ATVI) announced today that Destiny: The Taken King broke the record for the most downloaded day-one game in PlayStation history and set a new day-one franchise benchmark for both total players and peak online concurrency, surpassing the original Destiny launch day last September, which was itself the biggest new video game franchise launch in history. ...the Destiny community has climbed to over 25 million registered players. So how many copies of Destiny did people actually buy? The world may never know.